We are so sorry to report that our dear Sherry Conable has left us. Her body was found on Cowell Beach in Santa Cruz on Monday morning. There is no information yet on how this happened. Sherry was an indefatigable local activist for peace. She will be terribly missed. 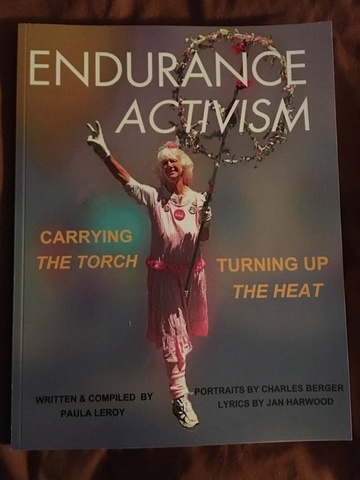 Her iconic photo was appropriately featured on the cover of our recently published book about the many long-term activists here. Our hearts are broken. 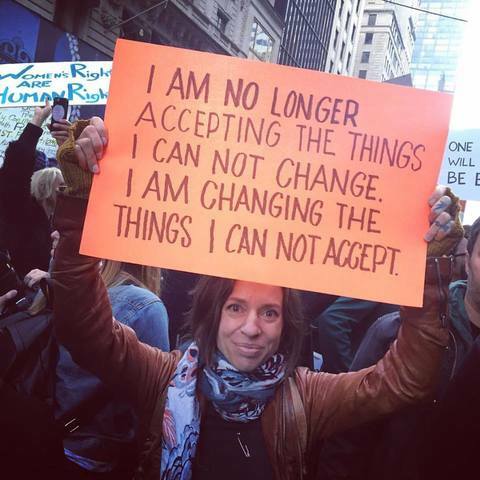 ICAN is awarded the 2017 Nobel Peace Prize! International Campaign to Abolish Nuclear Weapons is awarded the 2017 Nobel Peace Prize! In late September, 2017 our branch held a well-attended new member program featuring reports back from the Congress. 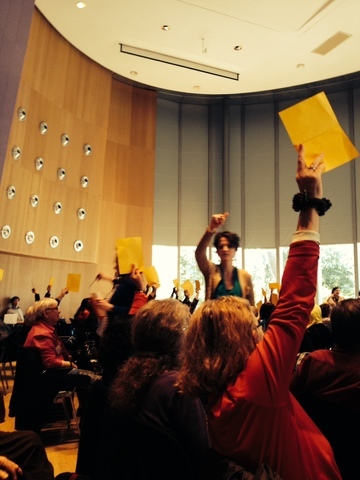 D. Nunes showed the WILPF celebratory video from the WILPF Congress to enthusiastic response. Nancy G.G., presented a 15 minute portion of my Congress workshops for them which nicely pinned down the first show of the eight in the upcoming community TV series, "Change the Story, Change the Future"
"We seize this centenary moment to reaffirm the principles and purposes of our founders, as relevant today as ever they were; to set out our current concerns and tasks; and to foresee the challenges ahead in the century to come." 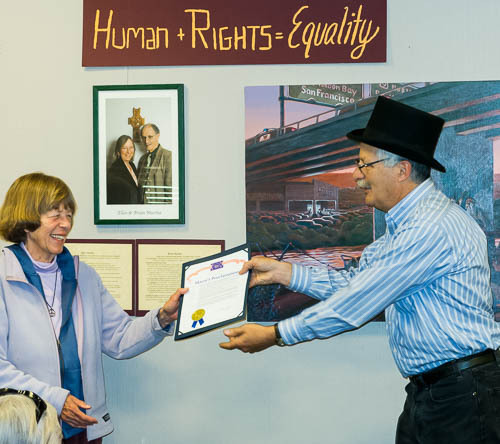 Santa Cruz Mayor Don Lane presents his proclamation to former Mayor & Santa Cruz WILPF member Celia Scott. It declares April 28, 2015 to be WILPF (Women's International League for Peace & Freedom) Day. It was presented at the Opening of the "Women, Peace & Power -- 100 years" exhibit at the downtown main library. See complete text of proclamation below. Mayor Don also made some additional, more personal, congratulatory remarks. There is a technique in communication to keep the dialogue going. It is called "Yes... and." You acknowledge what the other person is saying and add something, which either extrapolates on what has been said or gives information that may add facts to be considered, even may then contradict what the first person stated. However, you don't say "No," but keep the dialogue going. The dissatisfaction of day 2 about the apparent unwillingness to make changes or consider amendments to the Manifesto and Constitution/By-laws proposals was lying right under the surface. The theme on the second day of Congress could be called Communication. 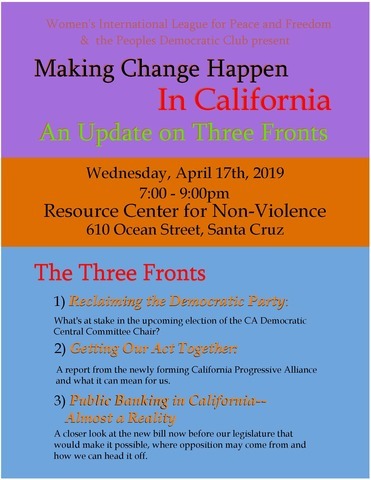 The busy program called for reviews of WILPF's finances, proposal for organizational changes, proposal for changes to the Constitution and the bay-laws, a new Manifesto and a discussion on draft resolution. So a lot had to be communicated and the room at the Peace Palace was filled with questions, critiques, and requests for amendments and, yes, hurt feelings. But let's first look at the two commmittees, which had not been able to communicate their work on day one. The Young WILPF faciliatator was optimistic about the interest of young women for the situation in the world, but they just have not come accross WILPF communications. They have their own website and seem to be forging ahead. I just returned from the first day of Congress in The Hague. Here are my impressions. Jane Doyle can probably get you pictures later. A colorful room at the Peace Palace displayed bouquets of yellow and red flowers and the people from all of the world brightened up the room even more. The women from the DRC were dressed in yellow dresses with names of countries and the WILPF logo on it! 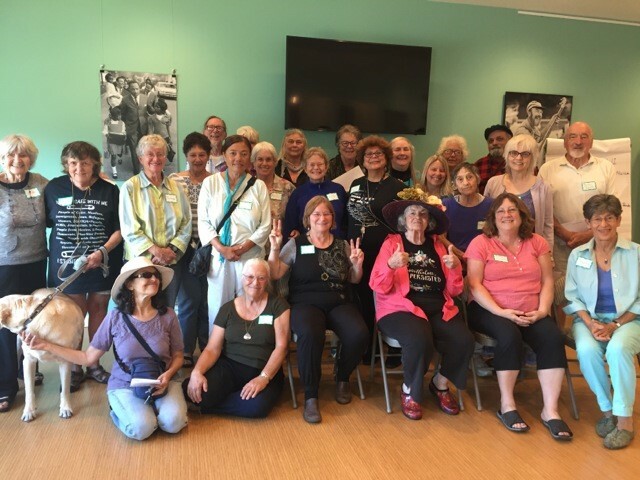 Eight enthusiastic WILPFers took the train to Chicago in March, 2015, and attended the celebration of women Nobel Peace Prize winners at Hull House on March 16th, along with a life sized replica of Jane Addams, WILPF co-founder. A Santa Cruz WILPF delegation boarded the train this morning on its way to a 100th anniversary event at the Hull House Museum in Chicago featuring two Nobel Laureates. Leymah Gbowee of Liberia and Jody Williams of the US.